Very comfortably furnished the self catering cottages are compact, cosy and being on one level are suitable for the elderly and partially disabled. They have been built with character, open beams and stone fireplace in the lounge, and central heating to provide excellent holiday accommodation nestling by Pendle Hill in the beautiful Ribble Valley . Situated on our working sheep farm (we have Swaledale and pure-bred Blue Faced Leicesters) just outside of Worston, near Clitheroe. The farm nestles at the foot of Pendle Hill and we have stunning views over the open country of the Ribble Valley. Angram Green is near Worston and Downham making itself an ideal base for the walker and cyclist. 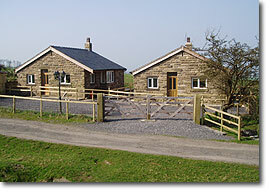 Close to the Trough of Bowland Area of Outstanding Natural Beauty and adjacent to Pendle Hill and Pendle Witch Country. 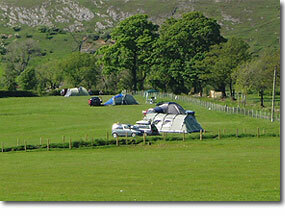 For the tourist there is easy access to the Ribble Valley, Yorkshire Dales, Lake District and West Coast. Available NOW NEW HOLIDAY COTTAGE (Sleeps 6) Click here for details. The two cottages Pendleside and Bridge End were purpose built to provide ideal holiday accommodation and are both equipped and furnished to the same standards. 2 bedrooms - 1 double and 1 with a pair of child size bunks (2' 6' x 5' 9'). Lounge, fitted kitchen with dining table and chairs, bathroom with bath and shower, toilet and basin. Both cottages are non smoking. 1 small well behaved pet is accepted by prior arrangement in Pendleside. Sorry no pets are allowed in Bridge End. We can supply groceries and basic supplies for your arrival. Cycle storage and wet weather gear drying facilities available. Shop: 2 miles. Pub: 1/2 mile, railway and bus station 2 miles.